(CHRIS) After the boys went to morning services, we met for breakfast. We put together a lunch for later and headed south and west. First stop was Banneaux, Belgium, site of the approved Marian vision of 1933. A young, poor girl named Mariette Beco saw Our Lady eight times here. The basic message was to pray hard. She called herself the Virgin of the Poor. The shrine was very nice. It was mostly outdoors, even the chapel, and was in a woodsy area. 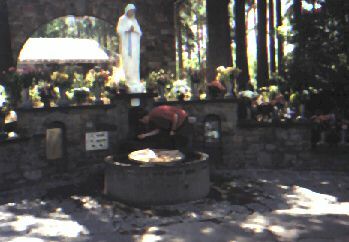 At the exact spot was a miraculous spring, of which we partook and by which we said a rosary. The whole trip I had been looking for a statue of St. Catherine Labore for Maureen. I finally found one here and got it--I guess they are very rare. Now I have a statue for each of us four Foley kids. We stocked up on B water (to replace our spilt Lourdes water) and headed out. We ate lunch by a little river in the shade. The drought season had just ended and the HOT season was at hand. Now, the ghosts of the broken imperial eagle were calling. Yes, we headed to the site of Napoleon's Waterloo, Waterloo. We paid about $8 to see the panorama painting and film, but neither explained squat about the battle. The panorama painting was awesome but not informative. The movie was REALLY DUMB--just two kids who imagine they are at the battle. The last site was impressive, though--The Lion Mount. 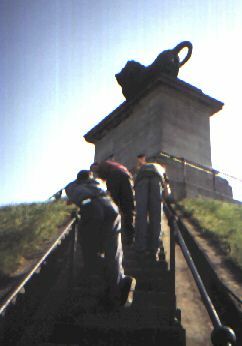 A huge mount with a lion statue up 226 steps from the flat landscape near the spot of Wellington's line. Impressive view of the battlefield. On the way down, Andrew sacrificed his pants to the god of grass stains by doing the Princess Bride "As You Wish" roll down the hill. We were impressed. It would have been even better if Jon had agreed to play Buttercup. Next we journeyed to near-by Brussels. We saw the cathedral there from the outside, but were not allowed in because of a Mozart concert. Tickets were too expensive. The exterior was impressive, though, because it still had its white look, unlike many blackened cathedrals. Must have been restored recently. On our way back to the car, we were able to go inside (around 10 p.m.) Nice place, I said, nice place. It had a Damien the Leper display and an incredible wooden carved pulpit with many life-sized figures on it. Since the special food of Belgium is mussels, we went out to eat at a cheap, but nice restaurant that served them. Only I ordered these Brussels mussels, though seafood was popular all around our table. They were good and came in a huge black pot. What I could not finish, Jon ate. Andrew's warning beforehand that, "mussels have the consistency of snot and the flavor of fish," was true, but somehow they were still pretty tasty. We got the local version of a Slurpee for dessert (another HOT day) as the salesman warned to drink it slowly or we'd get a headache. We walked to the car, saw the cathedral, and left town. 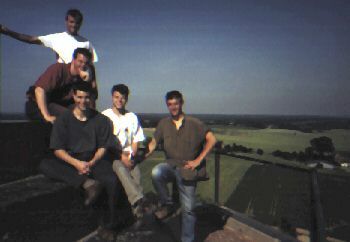 On the way back to Kerkrade, we tried (but failed) to sing a bit and frolicked like young lads. We were in Rolduc by the stroke of midnight. Sleep, we must--tomorrow would break early and warm and bright and happy. Zzzzzzz.